Just wanted to say how impressed I am with your product EquidGel. We have been using it for two of my horses since July, after being recommended by a fellow Endurance rider. One of the horse's, Reggie, is not exactly an endurance model so his management has been more tricky for us, especially this season when he has been aimed at upgrading to advanced status. He is a middleweight 16.2 gelding 50% Arab but 50% Warmblood so heavier and denser muscled than his pure bred, half-brother. One of the issues we have had with him is drinking during his competitions, as you will appreciate hydration is a major factor in gaining a good result. Once we started using EquidGel, he has gone from strength to strength; aided undoubtedly by the fact that he takes his EquidGel bucket with enthusiasm at every opportunity! We have had improved results, his in competition recoveries have been better, and quicker and his post competition recoveries amazing! In fact, he often has appeared to have no loss of condition or tiredness! The fact that your product maintains his vital hydration means his appetite is good and he maintains his optimum condition so easily! Our season target of upgrading to advanced was fulfilled in style with his final qualification, an 80km (50 mile) GER completed at higher speed and quicker recoveries than any other result throughout the season....he didn't look in the slightest bit tired! I have been involved in the sport of Endurance riding for almost 30 years and am so pleased that you have developed this product which will help so much with the care and condition of our competition horses! I was cautious about changing their diets to be exclusively EquidGel fed horses but can honestly say that both my boys looks amazing and clearly love their food! and happily also compares very favourably with cost to the feeds I previously used. I'm already looking forward to out 2015 season, when we hope both boys will be tackling some new challenges fuelled by EquidGel! My name is Ann Bone, my disciplines are BE, Hunting and Leisure. I just had to write to say thank you for your product Equidgel. I don't often take pen to paper but I just had to write to you and compliment you on it. My horse is a 22 year old, Bay TB Mare (15.2hh @ 500kg) and was suffering from a fractured jaw. I have used EquidGel since May 2014 and without a question of a doubt EquidGel has been extremely effective, so much so that my vet has now interested in the product for their equine hospital. The changes that I have witnessed are as follows - due to her injury my are lost weight rapidly as she was unable to eat hay or haylage and struggled with hard feed, but, thanks to Equidgel, she has now put the weight back in and is looking amazing. I have now started feeding my other horse on it and have just placed my second order of 20kg and for 20kg of Equidchop too. My other GBSH gelding 17.2hh 12yr old 625kg BE Novice eventer is now also on Equidgel especially whilst eventing, as it is so easy to fed at an event to rehydrate him. I am not sure if I have saved any monies as it is too soon to evaluate as I have only used it for both horses for two months but if I had not had Equidgel I am sure that my mare would not have been in the position to be back under saddle. If at anytime you would like a recommendation please do not hesitate to contact me. My name is Laura Hosking and I am a leisure rider, I have been using EquidGel for around 8 months. In fact I was one of the first to trial this revolutionary product. I used EquidGel for my 27 years old, 15.1hh cob and also on my friends 16.2hh ex racehorse, who is now 17 years old. The TB had previously been diagnosed with grade 3 gastric ulcers and has always shown terrible cribbing and windsucking behavior for the past 6 years and has had to wear a crib collar constantly. Since we removed all sweet feed and treats from his diet and put him on a complete EquidGel fibre diet, the difference has been remarkable, his windsucking has almost ceased and he very rarely has to wear his collar and his body condition has also improved considerably. He looks like a different horse? Unbelievable!! My old cob looks so absolutely fabulous with a beautiful coat and is very calm and relaxed. Because both my cob and the TB do very little work, they do not need a great amount of feed so I buy 20kg every 2 months and the owner of the TB buys around the same amount. This will increase in the winter. This is the only feed we use and it saves me about £6 per month. I will continue to use EquidGel as I am keen to feed a completely natural feed for the health of my horses. l think EquidGel is the most important new horse feed on the market and I will continue to use this amazing product. 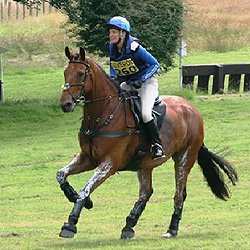 I am an Endurance GB rider and have been on the Scottish Endurance GB Team in 2013 for the home international event. I compete at Advanced level and most of my rides are between 65km and 120km in one day or 80km to 160km over 2 days. I started using EquidGel at the start of the 2014 season after being told about it by a friend and fellow Endurance rider. My horse is a 14.2 cob type weighing 475km, we struggle to keep him hydrated on long events ie 80km plus as he retains the heat in his muscles, using EquidGel this season I have noticed a big difference his final heart rates 46 bpm which were 2 or 3 beats lower than when doing the same rides in the 2013 season, where he finished on rates of 48/49 bpm. This is why I am convinced the added hydration provided by EquidGel before, during and after my races has helped to lower his heart rate especially at the vet gate when a lower heart rate is critical. This season the weather was a lot warmer so I would have expected higher heart rates not lower, therefore I will continue to use this product and also to introduce it to my other endurance horse that is starting his competitive career next season. I can't recommend this feed highly enough. I have a thoroughbred ex racer that was not doing well last Christmas. After being on board hunting for over an hour he would stop jumping and look at his belly, his coat was dry and he would get sore muscles really easily. Although his weight was good he was showing signs of muscle wastage from behind the saddle and over his bum. He would even look at his belly in a showjumping lesson when we stood still. He hates spurs and bites your feet when wearing them. I have been feeding an Alfalfa based feed for years, as this was a new horse not long out of racing. On talking to vets, nutritional people and people whose opinions I valued; instead of scoping we decided to treat him like he had ulcers. I met Sandra Murphy via a mutual friend and she introduced me to EquidGel and so I decided to give EquidGel a try. As my lad was used to a fibre based diet, he took to it very quickly because EquidGel is Alfalfa based. He has it as his daily feed and when I get to competitions. He will literally climb out of the box to get to it! The changes I have noticed are mainly that he no longer looks at his belly.... he has gained all the muscle and strength behind the saddle. The biggest change is his recovery time... it is so quick which means the muscles are hydrated and there is less muscle soreness. He is a team chase horse and I am at the end of a long season where we really push them hard and this season my horse is so strong and doesn't seem to tire. I do believe that EquidGel has helped to balance his gut and to help soothe the discomfort he was experiencing. It has also helped to keep him hydrated whilst competing and to provide him with an excellent source of nutrition. All my horses are now fed completely on EquidGel it makes sense that forage is what they are designed to eat not grain. I would like to thank you for introducing me to your product, EquidGel. After competing, Haxton would drink almost three quarters of a bucket of water, now having had his EquidGel in the mornings he no longer wants a drink straight away!!! Haxton is a bit of a stress head and tacking him up, he tended to stamp his front feet, because of anxiousness or ulcers I am not quite sure, however he no longer behaves in that manner. Both Haxton and my youngster Jaffa just love the stuff, they stand there hassling me while mixing it and if I am not careful they nick the bucket from me before I have finished adding the water! I do not worry now about either horse getting dehydrated as their buckets are licked clean. I have been told on more than one occasion how well my horse look, in their condition, health and shining coats.